Used in conjunction with a combined heat and power unit, the heat recovery steam boiler HRSB can play a significant part in strategies for using primary energy efficiently. The hot flows of flue gas from the upstream combustion processes are conducted into the heat recovery boiler and used for steam generation purposes. Thanks to its modular design and compact dimensions, it is the ideal choice for both new plants and modernisation projects alike. 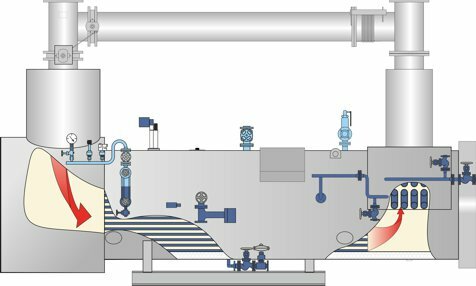 The heat recovery steam boiler, which is certified in accordance with the PED (Pressure Equipment Directive), is available in eight standardised versions. It consists of a highly efficient tubular heat exchanger. An economiser can be integrated as an option, which increases the efficiency of the heat exchanger even further. A flue gas bypass can be added if required. If no steam is extracted, the boiler will use this for diversion on the flue gas side. This means that the CHP unit or other waste heat sources can continue operating without interruption. The heat recovery steam boiler is insulated and features state-of-the-art safety equipment. The flue gas bypass is supplied separately to facilitate transportation and is fitted and insulated on site. The boiler control BCO, based on PLC, can be controlled via touchscreen and is housed in a separate floor standing or wall mounted control switchgear cabinet.